Photo by Dan Spalding, Times-Union A backhoe with a narrow trench cutter works on a crossing at CR 400S, south of Warsaw Tuesday afternoon in preparation for delivering new rail lines, which were stored inside the train in the background. The work crews are expected to reach Warsaw soon. The first stage in a significant rail line replacement project is chugging toward Warsaw and could arrive any time. When it does, the work is expected to cause traffic delays in Warsaw when several east-west crossings are temporarily closed. Those inconveniences for motorists, though, will seem minor compared to the second stage of work that commences in July. Preliminary work began two weeks ago, but has been slowed because other train traffic on the same line gets priority, according to Tom Lyons, track supervisor for Norfolk Southern. The work entails replacing 22 miles of decades-old track from Claypool to the Milford Junction and is the biggest project of the year for the entire Norfolk Southern system, Lyons said. The second stage, installing the lines, will take much longer. Progress so far has been slow and hard to predict. 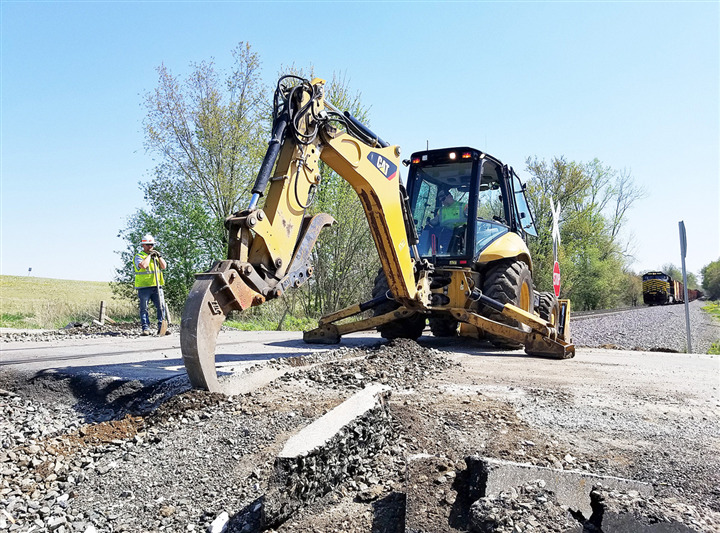 Lyons said Tuesday, as crews prepared to work on the crossing at CR 400S, that he believed crews could reach downtown Warsaw before the weekend. As of this morning, the crew was at least 2 miles south of downtown. Warsaw Mayor Joe Thallemer said he expects minimal delays during the first phase that could result in the halting of traffic at several crossings – Center, Main and Market streets – for upward of 30 minutes. But even that is a tentative prediction. During that time, emergency personnel will be positioned on the west side of the tracks in case they are needed on the western and southern parts of the city. Thallemer is already experiencing some frustrations. The city has been communicating with Norfolk Southern about updates and distributed flyers to the Dogwood neighborhood residents, which has limited access, about the apparent closings, only to learn later of delays. “I thought they would have been through by now,” Thallemer said. “So far early in this project, they’ve shown the difficulties they’re having even doing the simple part of it,” he said. Lyons said the first stage could finish work by the end of May and the second phase will begin in late June or early July. On Tuesday afternoon, a crew accompanied by a train carrying new rails from Steel Dynamics in Columbia City had reached CR 400S. The new rails are placed outside of the existing tracks on both sides. The process involves embedding the new lines in the roadway at crossings so road traffic is not interrupted. The second stage is expected to be more disruptive because the work involves multiple machines with a crew of more than 50 people, Lyons said. The process involves the placement of “cradles” in the middle of the tracks. The new rail is then placed in the cradle, and old spikes and rails are then removed and replaced. When that portion of work arrives in Warsaw, the city is looking to redirect traffic on Center and Main streets to Market Street. Officials will also ban on-street parking along part of Market Street to accommodate heavier traffic. The changes could remain in place for several weeks, he said. The second stage also involves the installation of conduit that will be used in a few years for work that will allow traffic signals at Main, Center and Market streets to communicate with each other and improve traffic flow, Thallemer said. Those upgrades are a separate project with Indiana Department of Transportation, Thallemer said. The second phase will begin in Claypool and head north. How fast it happens remains unclear. “Depends on track time, but they generally will give them a lot higher priority than other things out here, so we’ll expect to get about a mile and a half a day,” Lyons said.